This page is an essay by Zhang Hu. It is based on The Chinese way to decide game result and its evolution in book WeiQi ShiZhan ZhiNan by weiqi historian Zhao Zhi Yun 6dan. In ancient Chinese philosophy, Black is Yin and White is Yang. Ancient Chinese Philosophy: Yin and Yang are unity in opposition. White puts down a stone first, then Black puts down a stone. The number of moves is even. This is an important principle. The goal of each side's play is to capture more stones out of the board，on the other hand it is, place as many stones on the board as possible. These are (maybe) the oldest rules of weiqi. A speculation of modern people :under territory rules(Tang Song Dynasty style or Japanese Style rules),When you don't have any liberties to fill in, or you want to pass, because of Yin and Yang are unity in opposition, a virtual move is needed. A virtual move is a legal move. These virtual moves are not put down on the board, they are captured by the opponent directly . The player who has more captured stones out of the board wins the game(on the other hand, has more living stones on the board ). Because, other liberties are helpful for capture more opponent's stones, the basic two liberties are not helpful for capture more opponent's stones,but helpful for the group living. 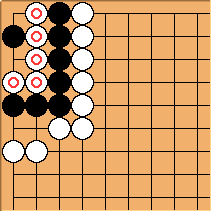 (2)if a group has no qi, it will be removed from the board (die), and if a "one eyed" or "eyeless" group has some liberties (qi4),and your opponent has not taken away ALL liberties of the "one eye group" or "no eye group" by some moves, the group is still living on the board, despite having only one eye or no any eye! White (marked) has not died, she is alive on the board. After some moves, White will die. Black has 2 groups, one group has m+2 points, another group has n+2 points of territory. In Japanese and modern Chinese rules it is a tied (jigo) game. But in ancient Chinese rules, White will win the game. This is because, if one wants to continue the game, another have to continue too. Again the important principle here is: Yin and Yang are unity in opposition, therefore you can not abandon your move (you need put down a stone or a virtual move). 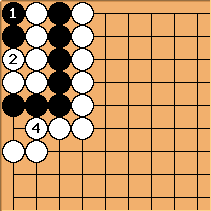 So, when White plays the (m+n+1)th additional stone, Black cannot fill stone in the basic libertiy (qi) of her groups!Black have to hand a black stone to White directly.Now,Black is in a situation named overflow.After two sides were overflow,the game is over. Because of the above reason, when we count the territory , we cannot count the basic liberties of a group into someone's territory. This is why the group tax is reasonable. So, cutting your opponent's stones into two groups has two points value at least. PS: If in a game, White and Black have the same amount of territory (not including the basic two liberties of a group), and White occupies the last dame on the board, then the next move, Black has to put down a stone in her or her opponent's territory. In ancient China, the above example results in a tie. That is fair. The ancient Chinese weiqi rules embody the essence of WeiQi. rsun: The komi was 0.
rsun: Diagonal star points were occupied by the players before a game was played. The four stones were set in place. White played first. First: Is it equivalent to Stone Scoring? "The number of moves is even." "Virtual moves are not put down on the board, they are captured by the opponent directly." "The player who has captured more stones wins the game." Second: Should it be alias "Stone Scoring" ? No - please: "Stone Scoring" should have it's own page, with plain passes and counting stones on the board, not in the lid. Just the same, OC, but let's skip any tricks there and put it as plain as possible ! blubb: Eh, "tricks"? I simply didn't know there's already a page dealing with Stone Scoring, and didn't want to write a whole new one right now. Anyway, now I've found it, and the alias is adapted. The "trick" is the one you miss to apply - see below . Thanks for moving the alias ! Bill: What is described here may be equivalent to stone scoring, but the extant game records indicate that territory was counted, not just captured stones. Also, even though some game records indicate that each player made the same number of moves, play stopped while there were still dame on the board. White was not forced to lose a point by making the last play. The ancient game appears to have been territory scoring with a group tax. See "The history of rules changes in baduk" by John Fairbairn in ICOB 2006: The 4th International Conference on Baduk (Myongji University). blubb: Btw, the concept of virtual moves has come back into our times, in order to allow equivalence of Japanese and (modern) Chinese scoring in the AGA rules. It's called "passing stones" there. Robert Pauli: See pass stone. Bill: I think a lot of this page is Zhang Hu's speculation. Virtual moves, for instance. Robert Pauli: Yes (even if the trick to count off instead on the board could very well have been in use). That's why I'd like to see his name under his text. Who purged it ? I'll put it back . . .
MortenPahle: Keep in mind that, using these rules, empty intersections and stones are counted as territory, otherwise the example below makes no sense. Robert Pauli: Don't confuse it, Morten. Only fillable empty intersections are "counted". Necessary eyes, "basic two liberties" as he calls it, shouldn't be filled and therefore don't help you to avoid passing over a stone. zhanghu: "territory" is not a correct word? because of my poor English. Please amend it. blubb: Hmm, I think, it *IS* confusing to use the term "territory" in such an uncommon sense. (See the question at bottom of this page, for an example.) We better should use "area" when talking about "empty intersections and stones". Bill: Except that he does mean territory. Stones were apparently not counted in the most ancient rules we know of (before the Ming Dynasty). Elsewhere on SL, I believe, John Fairbairn suggests that stone counting may have coexisted with territory scoring in pre-Ming times. Bill: Since writing that I have found out that the oldest known description of weiqi seems to describe some form of stone scoring. However, the oldest know game records used territory scoring. zhanghu: In rules of Ming Dynasty and Qing Dynasty, territory includes empty intersections and stones. Ming Qing rules are similar to modern Chinese rules, but Ming Qing Area rules include "one intersection" group tax. Ming Qing Area rules developed from Tang Song rules. the "ancient" Chinese rules which I am talking about are those used in the Tang Dynasty and Song Dynasty and even earlier. In these rules,territory does not include stones. Japanese rules are similar to the "ancient" Chinese rules, but the "ancient" Chinese rules include a group tax. blubb: As far as I know, the main idea of ancient Chinese scoring is StoneScoring and, hence, quite the opposite, actually. Bill: Later. 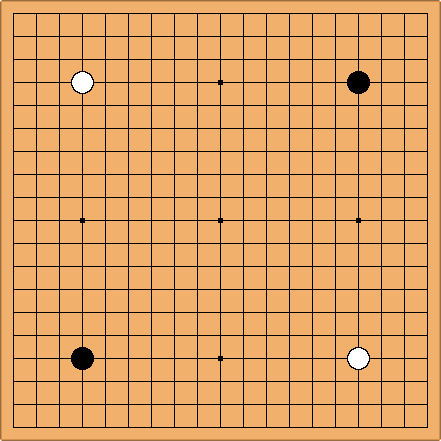 As indicated above, there is evidence for both stone scoring and territory scoring for ancient go. As John Fairbairn has suggested, maybe both forms of scoring coexisited. There is a clue in Hu's use of m+n+4 to refer to the score of a jigo, instead of 180. The goal of each side's play is to place as many stones on the board as possible. Due to the necessity of at least two liberties per chain (that is, either two separate one-intersection eyes or, in seki, either one eye and one shared liberty or two shared liberties), the intersection being not coverable by any stones remain neutral. That's where, when trying to express the differences in later Chinese (area) scoring, the group tax actually came from. However, the term "group-tax" is far from being sufficiently precise, as can be seen in various cases of (more or less sophisticated) sekis. Robert Pauli: Guess he simply means seki, not ? Robert Pauli: Sorry, with no extra rule the last dame is not shared: B fills, W passes, B passes, W passes: W gave two, B just one. Fails to adress the method (or trick) this page uses: comparing stones off the board instead those on it. Includes territory scoring, but actually you're doing area scoring, only counting it with the territory method. If you add group tax, for instance, you could also use the territory method to find the stone scoring result. We should distinguish the method or technique used to count from how the result is defined. Guess is was Robert Jasiek who proposed to tag the later with "scoring" and the former with "counting". Might be too subtle, but a distinction would fight constant confusion. blubb: I chose "scoring" intentionally, because I was well aware of this difference. :) The calculation isn't meant to show any particular counting technique here, like filling prisoners into territory, pointwise counting on the board or anything like that, but sticks to what the scores are determined by: territory + captives for territory scoring, conquered board points for area scoring, maximal number of placable living stones for stone scoring. You can apply various taxes to any game, not affecting the scoring basics but the score only, can't you? A pass-tax e. g., adapts the result of territory scoring to the one of area scoring within an accuracy of 1 point, while an empty-triangle tax does not. In zero move tally games, a group tax can adapt both area and territory scoring to stone scoring. Anyway - I took the "territory-counting" stone scoring suggested by zhanghu for an explanatory mistake and attempted to correct it, but now I see that I might have been the wrong part. I didn't read carefully that he was referring to even earlier times. However, it's hard to believe that the group tax was invented while counting (empty) territory rather than stones. It would be really helpful to get access to the sources. Bill: There was plainly no concept of a pass among the Japanese in the early 20th century, and there probably was none among the ancient Chinese. However, this segment gives the impression that the ancient Chinese rules were a form of no pass go. In fact, games stopped when there were still dame on the board. Does anyone have a picture of the "Wu Diagram" earliest recorded Go game (around 250 AD 1118 years before the Ming) this would make it early Han Dynasty this should show if the Chinese used stone counting or intersections as territory.